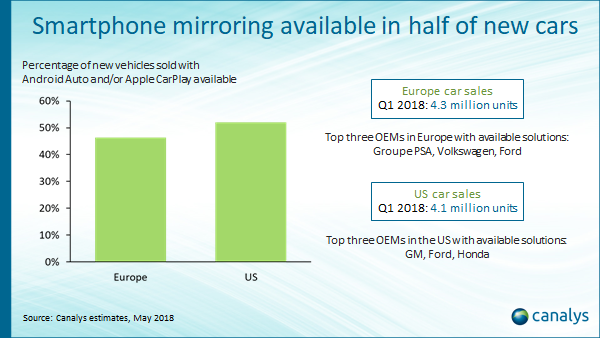 Canalys estimates that Android Auto and Apple CarPlay were available in 46% of new vehicles sold in Europe in Q1 2018 and 52% of new vehicles sold in the US. Smartphone mirroring solutions, such as Android Auto and Apple CarPlay, have become key features in hundreds of car models in 2018. Mainstream automotive OEMs, such as Ford, GM, Groupe PSA, Honda and Volkswagen, have the highest percentage of new vehicles sold with the capability, either as a standard or optional feature. Most automotive brands that offer the solutions offer both Android Auto and Apple CarPlay – the driver selects the solution depending on their smartphone. BMW Group is the main exception, including Apple CarPlay but not Android Auto in its BMW and Mini vehicles. Canalys estimates that in Europe, 78% of smartphone users have an Android phone, against 20% with an iPhone. In the US, 56% of smartphone users are Android owners, against 43% with iPhones. The solutions show key smartphone applications, such as maps, music, audio books, podcasts and communication, within a familiar user interface (UI) on the vehicle’s built-in display. But, crucially reducing the need to touch the display, voice assistants are integrated. Smartphone mirroring solutions and in-vehicle AI voice assistants will evolve quickly. At its recent I/O developer conference, Google announced plans to embed a custom Android OS into future vehicles. With Volvo its first automotive OEM partner, voice will be the main UI. Future AI voice assistants will better respond to and anticipate driver and multiple passenger demands. “The tech giants work at a different speed to the automotive industry,” said Sandy Fitzpatrick, Canalys VP. “The automotive OEMs must decide whether to concede the underlying control of the infotainment system and UI to the likes of Amazon, Apple or Google, or partner or compete with them.” Some notable automotive brands that did not offer Android Auto or Apple CarPlay in Q1 included Lexus, Mazda and Tesla, while Toyota has only enabled Apple CarPlay in one new US model and Jaguar Land Rover will include the solutions from Q2. This data is taken from Canalys’ Intelligent Vehicle Analysis service, the only market intelligence service that focuses on identifying which driver assistance, connectivity, convenience and safety features sell in the different vehicle models, on a quarterly basis.